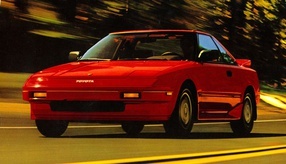 When the second-generation Toyota MR2 bowed in for 1991, it brought the original two-seat design into more modern times. The squared-off, sharp-edged styling was replaced with a more vibrant, aerodynamic shape. The optional 200-horsepower engine provided another jolt of youthful vigor. Unsurprisingly, the second-generation MR2 has become something of a cult classic thanks to its impressive performance and styling that still looks surprisingly fresh—more than 21 years after its introduction. Andrew McGibbon is one of the car’s faithful: He’s been a fan of the second-gen MR2 ever since he first laid eyes on one. 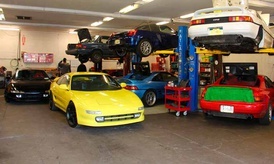 That’s where the MR2 came into the picture. In 2002, Andrew acquired his first one, a naturally aspirated 1991 example. At the time, Turbos were still pretty expensive, so the more affordable version seemed like a good idea. “I put a few mods on the non-Turbo to get a few extra horsepower and a little better handling, but after driving a friend’s MR2 Turbo, I felt the need for some more power,” he admits. He saved every penny he could, and he also managed to sell his first MR2. Soon, he replaced it with a 1992 MR2 Turbo. “After modifying it a bit and getting some more power out of it, I really felt like the MR2 Turbo was for me,” he says. Through the years, Andrew has owned multiple examples of the model, including a couple first-generation cars, many second-generations and, more recently, even an MR2 Spyder. At some point, Andrew realized that the cramped Spyder was pretty inadequate as a daily driver. “I sold it and thought I’d get out of the MR2 scene for a while—maybe for good.” However, once a car guy, always a car guy: A short time later, he found himself on craigslist hunting around for cool cars. 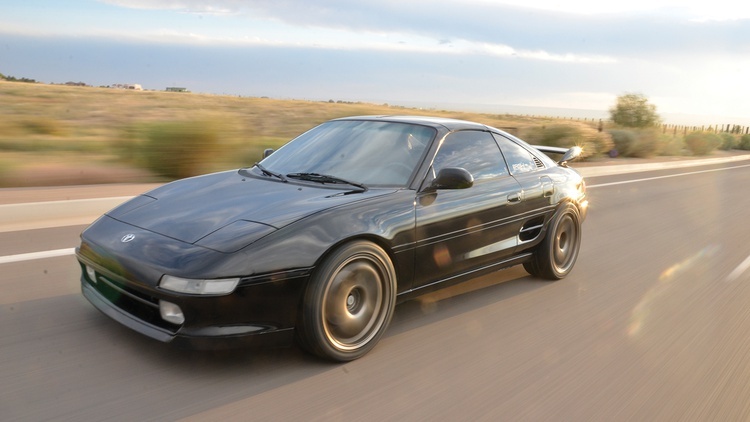 And, what do you know, there was a second-generation MR2 project for sale. “It had a blown engine, which was in a million pieces,” Andrew says. Of course, there was a silver lining: It was an ideal base for an engine swap. As a bonus, the seller had already installed all the updated bits that came from the model’s 1998 facelift. Yes, Toyota axed the U.S.-market MR2 in 1995, but they continued selling in Japan until 1999. Those fresh parts included taillights, a rear spoiler, a front lip spoiler and body-colored side moldings; the seller also followed the Japanese market’s lead by deleting the front side marker, which cleaned up the styling. The craigslist car’s paint and bodywork were in nice shape, so it wouldn’t need any work in that area. Once Andrew had hauled the car home, he set about gathering the parts for the engine swap. He had previously transplanted a 3.4-liter V6 from a Tacoma into a 1991 MR2 with mixed results, so he decided to follow a more conventional route. There were quite a few MR2s running around with the 1MZ-FE 3.0-liter V6 from the Camry, so the project veered in that direction. “I bought this 1MZ-FE engine and its accessories off a guy who already had it installed in his MR2, but had pulled it out,” Andrew explains. “I thought this would be a great way to do the swap, since all the parts would already be there and it would be more or less a plug-and-play affair.” Pretty sound logic—in theory. Though there’s more than enough room under the MR2’s engine cover for the Camry engine, this conversion is typically far from a bolt-in affair. And despite the chaos he was facing, Andrew forged ahead anyway. The MR2 Turbo’s stock five-speed is relatively durable, so Andrew retained it. “The transmission bolts up, but you must use a Camry 1MZ-FE flywheel with the four-cylinder MR2 Turbo clutch and pressure plate,” he advises. The flywheel is the same part used on Camrys and Solaras fitted with the optional five-speed manual gearboxes. 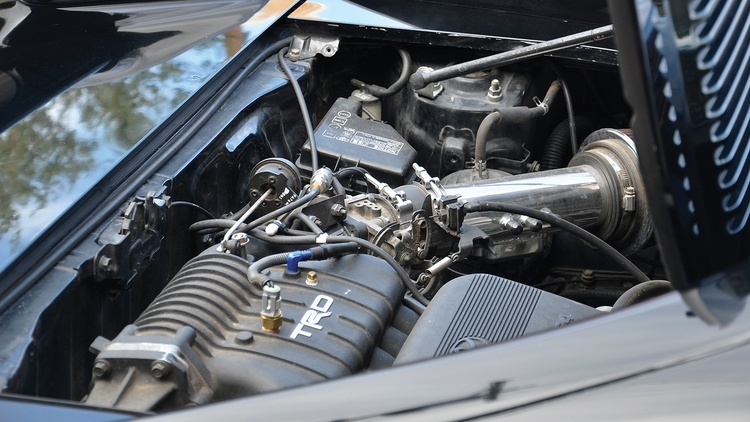 Once the V6 was planted in the engine bay and running, Andrew began extracting more power from it. 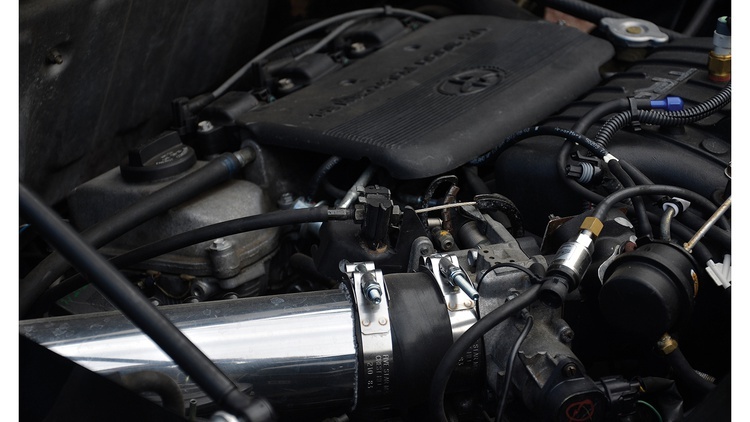 Stainless-steel headers from Bedell Racing replaced the stock Camry exhaust manifolds. Andrew broke out the welder and fabricated the remainder of the exhaust himself, which is 2.5 inches in diameter and exits from dual MagnaFlow mufflers. By far the biggest improvement to the V6’s power output comes from the TRD supercharger that Andrew bolted to the engine. The final step in the process: seeing if the work would pay off in real performance figures. 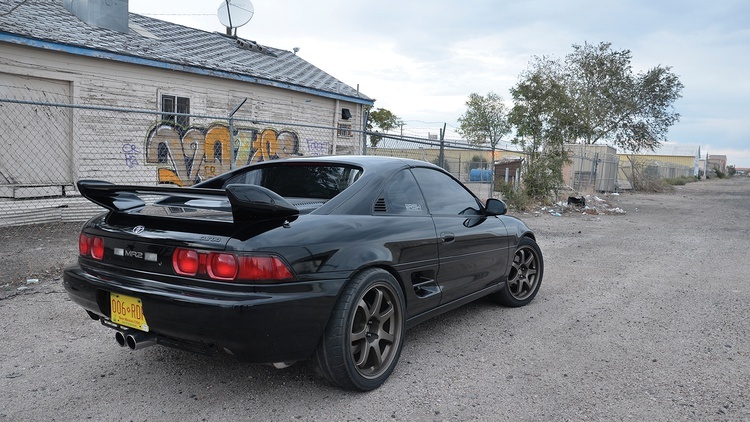 Sure enough, when the MR2 was hooked up to the Motiva Performance chassis dyno in Albuquerque, New Mexico, while running on E85 ethanol, the blown V6 pumped out an impressive 273 rear-wheel horsepower and 251 lb.-ft. of torque to the wheels. The revival didn’t stop in the engine bay. Inside the MR2’s cockpit, Andrew continued the upgrades. 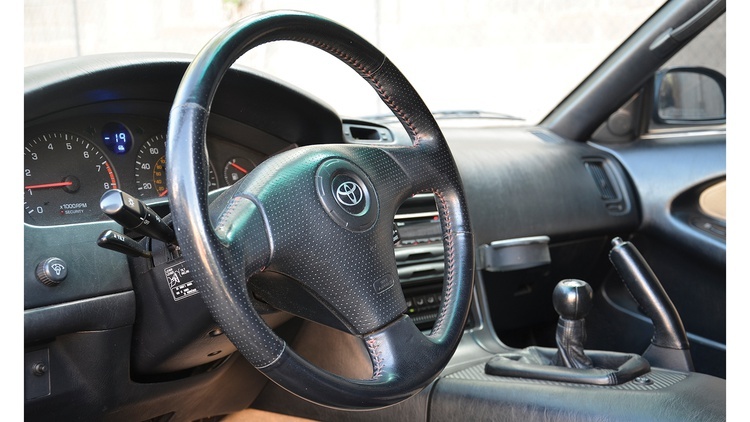 A thicker and sportier steering wheel from a 2002 Corolla S was installed. In keeping with the OEM approach, a TRD shift knob now adorns the interior. The stereo has been upgraded, and a seat heater has been installed in the driver’s seat—which, like the passenger’s seat, has been reupholstered. 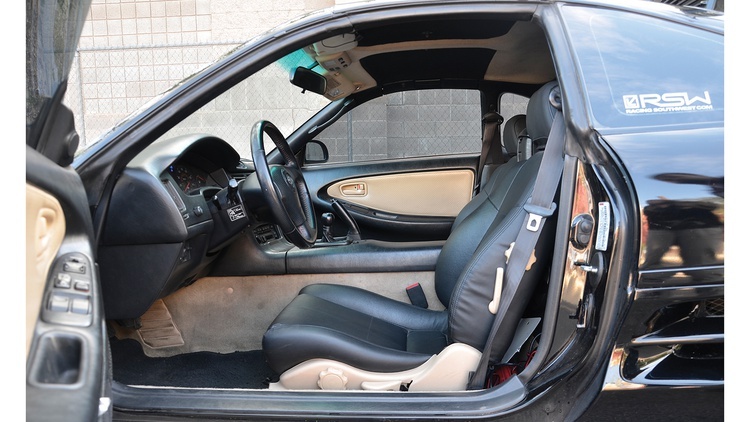 When Andrew bought the MR2, the interior was all tan and looking a little drab from years of use. Over time, he has added black accents, resulting in a far more attractive two-tone look. The second-generation MR2’s chassis is pretty competent in stock form, easily handling the 200-plus horsepower the stock engine can produce, plus a slew of upgrades take this example’s agility to the next level. TRD lowering springs were installed along with Bilstein shocks. An Addco front anti-roll bar reduces body roll and improves turn-in, while urethane suspension bushings tighten up chassis feel. The brakes are stock, but the pads are from StopTech. The final step in the chassis upgrades was installing the right wheels and tires. Here, 17x8-inch and 18x9-inch MB Weapon wheels do the trick. 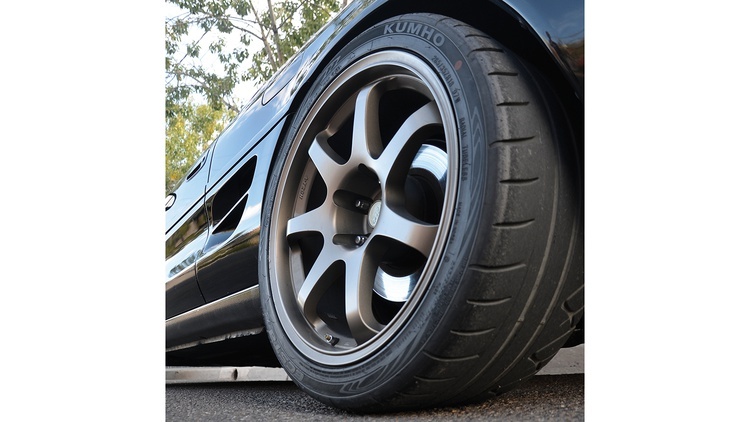 The bronze-colored wheels are shod with 235/40R17 Dunlop Direzza Star Spec tires at the front and 265/35R18 Kumho XS rubber at the rear. Andrew uses his pumped MR2 as a weekend fun car as well as his track day and autocross machine. Though the MR2 sees its share of hard driving at competitive events, that’s far from the car’s primary purpose. 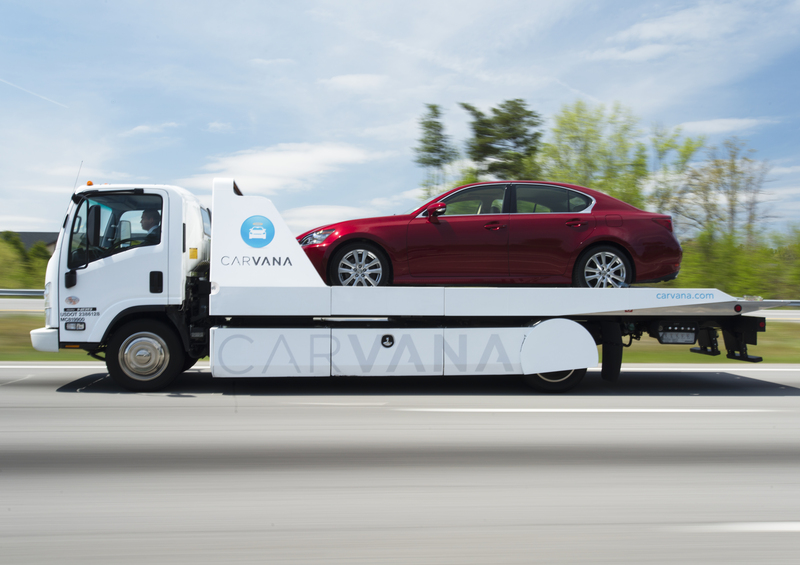 “It’s my super-fun street car that does okay locally in its class,” Andrew explains. And that, he says, is exactly how he wants it to be. I raced against a Mr. Two back in 1991, I recall how fast it was, it went by me on Lap 2 on the straight like a rocket, a rocket spewing mass quantities of green liquid out of every opening in the rear end. It ceased to run shortly after. Rinse and repeat that for the rest of the season. Fast is not much good with engines that won't be cooled. oddly enough, MR2's almost never overheat because they have miles of radiator piping, so their coolant capacity is really high. Tons of thermal mass to add that heat to. Add to that they purposefully designed the underbody trays to draw air up through the bottom of the engine bay and out the "hood" vents, making use of the low pressure zone behind the rear window, it gets plenty of cooling. Now, it is tricky to cool boosted setups, but that's the air charge, and is why water to air systems were invented. Yeah, I had an ITA MR2 and tracked my MR2 Turbo for a while. No issues at all with cooling. Now if you do have to work on the cooling system, they need to be "burped". 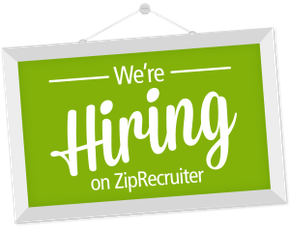 If you don't, air pockets can form and cause overheating issues. There are specific ways to accomplish this in a MR2 that is different than front engine cars, and you have to know the tricks. Still a car that will have a welcome home in my garage someday if the finances and opportunity line up at the right time. I think I'm gonna have to build a shed if I keep up that mentality, because I'm not really one to let cars I enjoy go. There are at least four V6 MR2's running around on the forums, including mine. Links below for those who enjoy more reading! Mine just got finished running, and it's heading in the direction of the build that's detailed in the main post of this thread. The V6 cars are very fun to drive because of the torque, and are dead stinking reliable. One of the most fun swaps out there that can be completed for not too much $$ (if you use a N/A chassis and the N/A transmission, it literally bolts in). I've always said I'll own a 3rd MR2 in my lifetime, assumed it was either a normal turbo 2nd gen or a swap by Prime Performance. Maybe I really need a V6 MR2? Refresh my memory, isn't the 1MZ the engine that was in the Camry that GRM tried to hop up a few years back? The one that had a couple issues with sludge basically trashing the engine? Also also also, anyone else familiar with the Sard MC8? Now THAT is a car they really should have homologated! Yes. Because of the angle the engine sits at, oil will pool in one of the heads under hard cornering which then leads to starvation. 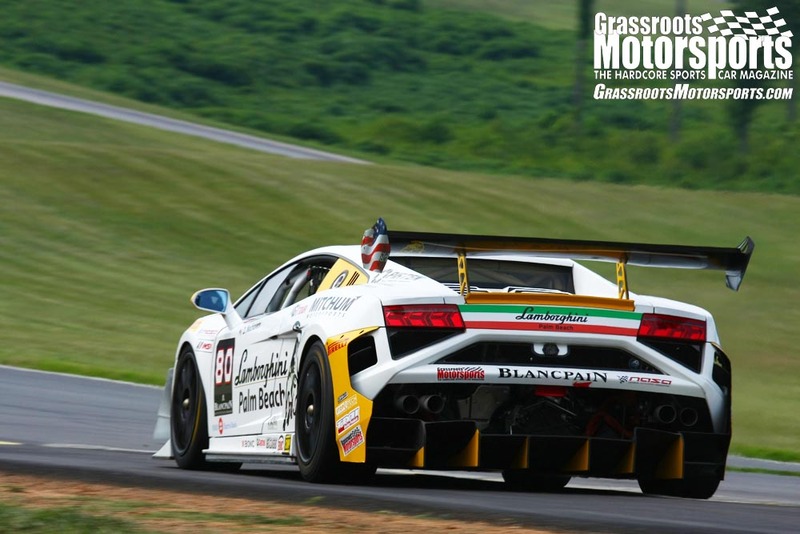 The only real solution is an accusump/oil accumulator, which has been used by multiple amateur race teams with success. SARD MC8 is possibly the coolest car to ever be produced by Japan. 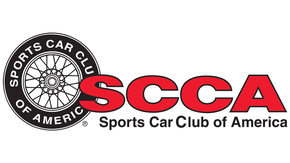 0 to 60: 4.9 sec.